It’s with a heavy heart that I write this brief piece in tribute to C. Everett Koop, our nation’s former surgeon general. He was born October 14, 1916. He passed away peacefully yesterday at his home in Hanover, New Hampshire. He was 96. Dr. Koop was born in Brooklyn, New York. He completed his bachelor’s degree at Dartmouth College, his medical degree at Cornell, and his doctor of science degree at the University of Pennsylvania. For decades he served as surgeon-in-chief at the world-famous CHOP (Children’s Hospital of Philadelphia). He was also a professor at Penn. He was well-published and he developed numerous important surgical procedures. Then, in 1981, he was appointed by Ronald Reagan as deputy assistant secretary for health and, shortly thereafter, surgeon general of the United States. He remains the one U.S. surgeon general whose name I consistently remember. During his tenure he steadfastly championed several important health and social issues, including AIDS awareness and the importance of smoking cessation. Following his service as surgeon general he eventually returned to Dartmouth, where he held professorships and founded the C. Everett Koop Institute at what is now called the Geisel School of Medicine. I met and spoke with Dr. Koop following his lectures while I was a resident there. His personality was as colorful as his bow ties. I thoroughly enjoyed speaking with him and hearing his thoughts regarding the direction of medicine and the politics of the administration of health care in this country. These issues were not otherwise routinely taught to us postgraduate trainees, and no one at the time could have dreamed about how important an awareness of health care administration would be now in the 21st century, a genuine health care crisis looming as it now is. It was abundantly clear to me that Dr. Koop honestly cared about the welfare of all Americans. I loved his enthusiasm and his ongoing interest in teaching, despite his advancing age. 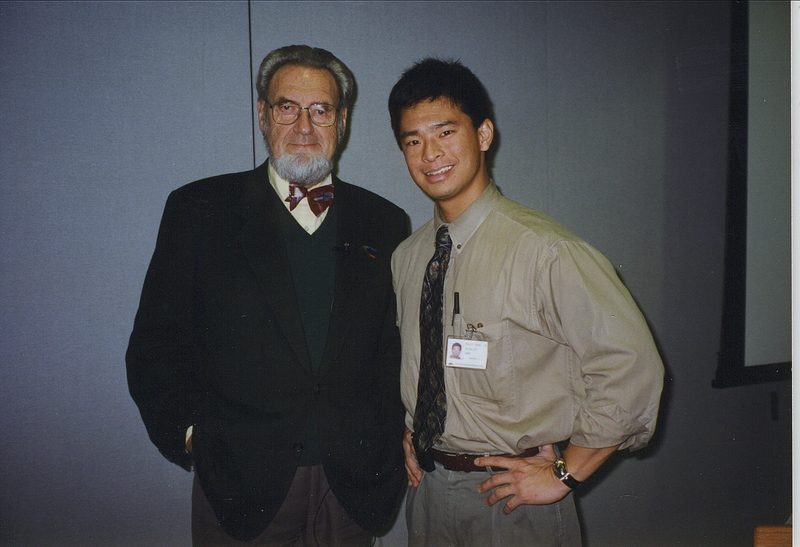 I believe the United States would benefit from more physicians like C. Everett Koop, those who have the courage to stand up for what they believe in and what they believe to be right. He will be missed, both in the Upper Valley and way beyond. Sleep well, Dr. Koop. This entry was posted in Tributes and tagged C. Everett Koop, C. Everett Koop Institute, Chick, Chick Koop, Dartmouth, Dartmouth-Hitchcock Medical Center, DHMC, Hanover, Koop, Lebanon, Morris Chang, New Hampshire.